It has been about a month since I started my slow conversion from tomboy to girlie girl, and I wanted to update you on my progress. I’m not doing so well. Sure, I’ve done my hair and put on clothes other than sweats, and I’ve made an effort to apply make-up in the places it is supposed to go, but I’m pretty sure that people can tell I’m just a tomboy in dress-up clothes. When I sat down to list the activities that would likely move me from just pretending to really pursuing full girliness, I started to get a pit in my stomach. One, it would dip into the college funds we have set up for the kids, and two, it would hurt! Women are masochistic! Think about all the things we do in the name of beauty. High heels are the most ridiculous foot accessory. Not only can you not do any sports in them, but I for one, can hardly walk! Then there is the waxing. I do pluck (my eyebrows), so I can put up with small amounts of pain, but the thought of the full brow waxing or the upper lip rip…ahh! Don’t get me started on the bikini wax. I start to well up a little bit just thinking about it! Botox, implants, make-up tattoos, piercings, laser hair removal, and liposuction are all part of the full transformation, and I’m not sure I’m up for it. I’m starting to wonder if I might have gotten into the game just a little too late. Maybe if I had started in heels as a five-year-old, I would be able to play sports in them by now. If I had done child beauty pageants instead of soccer tournaments I would know how to apply make-up, accessorize effectively and walk like a lady. Can you teach an old tomboy new girlie girl tricks? Maybe, but I am finally declaring that I may not want to be as girlie as the girliest of girls. As a result of these revelations, I have come up with a spectrum of girliness, and my new goal is to just move further down the scale knowing that I am NEVER going to reach the pinnacle. 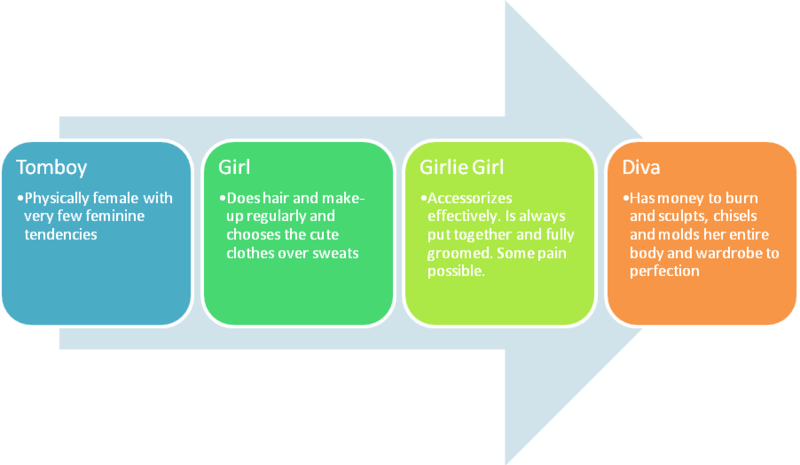 I hope I will eventually land somewhere between girl and girlie girl. I enjoy so many of the things that girlie girls do. Manicures, pedicures and massages rock. I enjoy having someone do my hair, and one of my new favorite things to do is sit and chat while femininely sipping my coffee. I do hope, however, that I’ll start to enjoy shopping. I hate to shop, but I know that in order to move up the girlie scale, I am going to need to improve my look with newly purchased items. I just know that I don’t want to spend money on something that brings me pain. While I may actually try the eyebrow and lip waxing, I am doubtful that I will adopt any other pin-pricking activities. I am admittedly just a little too wimpy. I guess it helps that I have a standing date with someone who will take me out in sweats and a baseball cap or in heels and a dress. For him, and for me, I still feel compelled to make subtle improvements so that when I do put on the heels, I actually look like I know what I am doing. I think I fall somewhere between a girl and a girlie-girl…and I don't have the money to be a diva!! Oh my! I am so not a girlie girl and was always a tomboy as a kid. I never learnt how to properly apply makeup and still have no real clue. I do like lipstick and can apply a layer of foundation but beyond that, forget it. If I put on eyeshadow I just end up looking like a panda. Waxing? Botox? Implants? No, way too scary!! I love going for a facial, or massage or pedicure too and getting my hair done is a treat because when I do it myself it is always a disaster. I can't even get my daughter's hair into two pigtails for goodness sake! I do like shopping for clothes but always end up buying the same things as I don't really know how to shop for what's right for me. I need to go on What Not To Wear – that would be wonderful! Then I might stand a chance! You are so funny! And I love your spectrum of girliness. I'm a tomboy as well, and honestly, I've given up all hope of ever being anything but. Sure I can dress up when I need to, with high heels and makeup and hair, but I'm most comfortable in workout clothes. I don't think I'm ever going to change. So good for you for continuing to strive for the girlie girl lifestyle. I'll continue to wear my sweatpants and running shoes while living vicariously through you!